The first eight buttons produced by Kitchen Sink "Enterprises" and Denis Kitchen (in 1973) were individually numbered in small circles on the respective images. Most of these were made for promotional purposes. In 1975 a company "division" was created called Pinback Jack, to create buttons for sale to collectors. 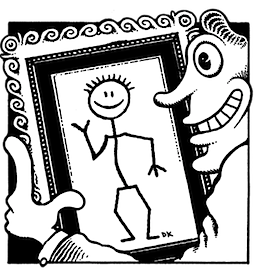 The first such set was the 52 (ultimately 54) Famous Cartoonist Series of self-portraits. Each of these was numbered prominently in alphabetical order (except for the two stragglers). The numbers on these buttons understandably became the official "order numbers," even though eight buttons had preceded this set chronologically. The earlier 8 buttons were designated 1-A, 2-A, 3-A etc. in various Krupp and Kitchen Sink catalogs. Most buttons following the Famous Cartoonist Series sequence are individually numbered somewhere within the image or on the rim. The last button thus numbered is #156. 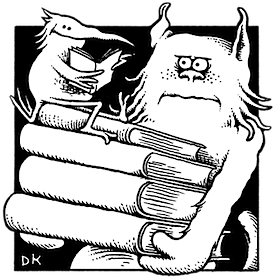 Three promotional buttons for a comic series called Denizens of Deep City were produced following button #133 but were somehow not included initially in the internal system. Thus these three are thus known as 133-A, 133-B and 133-C. Similarly two "Freak Brothers Munchie Bars" variants (#204-A and #207-A) were not officially counted. 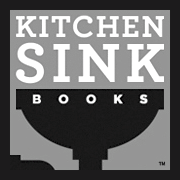 There were 214 officially numbered buttons in the cataloged sequence when Kitchen Sink Press folded in early 1999. But in actuality there were 227 produced (214 in official sequence + the 8 earliest buttons + 3 Denizens buttons out of sequence + the two Freak Brothers variants). 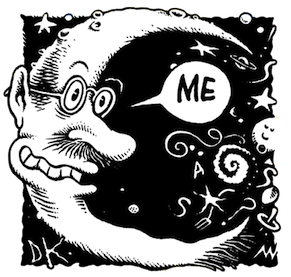 When Denis Kitchen formed his new small press and art and literary agencies in 1999, he continued making promotional buttons for various properties and projects. He continued the numbering system established earlier, but he started with No. 228 to finally get the overall sequence correct. This also explains why there are no buttons officially numbered 215 through 227. We hope this background makes the logic and chronology easier for you to understand. After 1984, KSP stopped producing buttons that were primarily intended for sale to collectors. After a 4-year hiatus, buttons produced beginning in 1989 were of a promotional nature. They were generally given away to distributors, to retailers and at comic book conventions, or offered free to catalog customers who ordered certain products. After 1988, virtually all giveaways were the smaller 1.25" diameter size (#158-161 are exceptions). Buttons produced by Denis Kitchen Publishing & Denis Kitchen Art Agency. The numbering below reflects the fact that at total of 227 buttons were produced earlier. This corrects the 14 digit discrepancy in the "chronological" catalog numbering which originally factored neither the first eight buttons produced nor three later designs (133-A, 133-B and 133-C, 204-A and 207-A). It is impossible to correct the numbering back to the beginning because actual series numbers are incorporated into the design of most buttons from No. 1 through 156. From #228---on the numbers reflect the true chronology. Allen, Doug 2 184, 185. Armstrong, Robert 6 2, 73, 78, 79, 80, 92. Bushmiller, Ernie 6 128, 129, 134, 156, 245, 246. Cabarga, Leslie 8 9, 56, 69, 93, 130, 166, 167, 186. 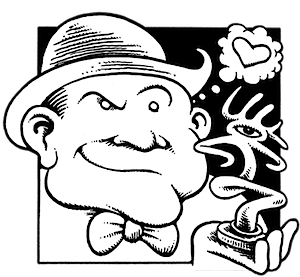 Crumb, Robert 19 13, 58, 62, 63, 82, 83, 84, 85, 113, 114, 115, 116, 117, 118, 189, 202, 213, 242, 243. Cruse, Howard 3 14, 68, 102. Darmsteader Chet ("Xno") 3 131, 132, 133. Eisner, Will 5 16, 89, 94, 152, 240. Elder, Will 3 17, 229, 230. Fleischer Brothers 1 53 (See also 33). Frazetta, Frank 3 235, 237, 257. Geary, Rick 2 154, 164. Green, Justin 3 21, 60, 70. Griffith, Bill 3 22, 59, 91. Kitchen, Denis 24 1-A, 2-A, 3-A, 4-A, 5-A, 7-A, 8-A, 26, 61, 64, 65, 67, 88, 136, 137, 138, 139, 140, 141, 157, 228, 231, 232, 256. Kurtzman, Harvey 8 28, 153, 225, 226, 227, 229, 230, 241. Landman, Mark 13 142, 143, 144, 145, 146, 147, 148, 149, 158, 159, 160, 161, 211. Loft, Peter 4 4-A, 29, 61, 87. Mavrides, Paul 8 203, 204, 205, 206, 207, 208, 209, 210. Meyerowitz, Rick 1 72 (54-A). Nicholson, Jeff 2 194, 195. Poplaski, Peter 28 2-A, 4-A, 6-A, 7-A, 34, 54, 61, 66, 67, 74, 75, 76, 77, 86, 95, 96, 97, 98, 99, 136, 137, 138, 139, 140, 141, 157, 168, 212. Potter, Doug 3 133-A, 133-B, 133-C.
Ranson, Arthur 2 191, 192. Rippee, Larry 2 104, 105. Schultz, Mark 8 135, 177, 178, 179, 180, 181, 182, 183. Shelton, Gilbert 9 43, 203, 204, 205, 206, 207, 208, 209, 210. Simpson, Don 6 122, 123, 124, 125, 126, 127. Waller, Reed 2 106, 150. Welz, Larry 7 171, 172, 173, 174, 175, 176, 196. Whitney, Gary 7 107, 108, 109, 110, 111, 112, 119. Williams, Robert 2 162, 163. Williamson, Skip 2 50, 57.